Telegram, a popular instant messenger, has started rolling out an update to its Android and iOS apps. The update adds several new features along with some improvements and tweaks. The update on Android (v3.5.1) and iOS (v3.5) brings Voice Messages v2.0, which now has a new interface with waveform visualisations. It also has a new player, enabling users to listen to long voice messages and switch to other media or chats at the same time. 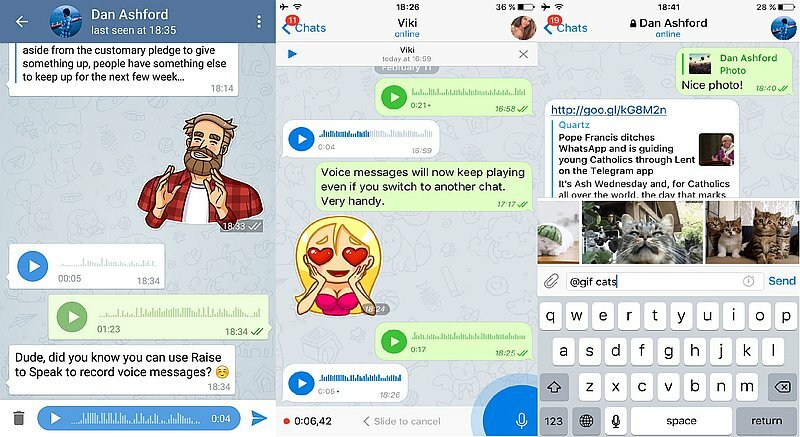 The update makes it easier for Telegram users to record and listen voice messages with raise-to-speak and raise-to-listen functionality. This means that now when a chat window is open, users can simply pick up their handsets and bring it close to their ear (as if taking a phone call), and hear the new voice messages or record a new one after the signal. “This feature involves plenty of behind-the-scene magic with proximity sensors, gyroscopes and accelerometers. It works well with most modern devices, but is still experimental. Some phones may require arcane intervention from our devs,” addsthe company blog post. In addition, a bunch of updates have been added in different sections inside Telegram. Users can now decide who can add them to groups and channels with granular precision. Supergroup creators can now change admins who can add new members in a group. A Supergroup can include up to 1000 members. New animations have been added to attachments and the ‘Image Search’ option now sits in the ‘Photo or Video’ section. For iOS devices, users can now share any photo, video, audio, document or location to any Telegram chat or channel directly from default apps like Contacts, Maps, Voice Memos and Photos. They get the ability to share content to multiple chats or channels at once. iPad users with external keyboards get hotkey support as well. For Android, the updated Telegram app introduces additional photo-editing tools – rotate, fade, tint and curves. “We’re not done with updates this month – more features and good news are coming very soon to a Telegram Messenger near you,” says the blog post.